The apartment consists of two rooms. Living room and bedroom studios, Total area of 65 m2. The apartment is located on the 2nd floor of the five-storey building. At the entrance is renovated and installed steel doors with mechanical combination lock at the front on the first floor concierge is on duty around the clock. 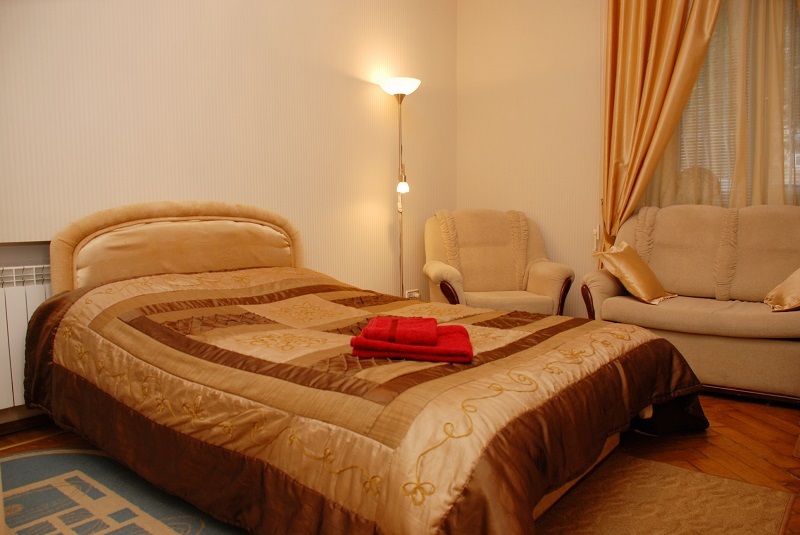 The apartment is located in the centre of Kiev in close proximity to Lva Tolstogo Square and near Olympic Stadium. Getting to the main street, Khreschatyk, takes 10 minutes of walking at a leisurely pace. Near the building there are grocery minimarket, mega market, Butterfly cinema, ATM, Lva Tolstogo metro station or Olympic Stadium metro station. A bus stop is situated at distance 50 meters from the building. A children's toys shop, Skazka, is situated on the first floor in the building. The theater of operetta is located at distance 50 meters from the building, and Olympic Stadium is located at distance 80 meters from the building. The most popular fast food restaurant in Kiev, Puzata Hata, where it is possible to eat tasty and for a low price, is situated at distance 300 meters from the building. 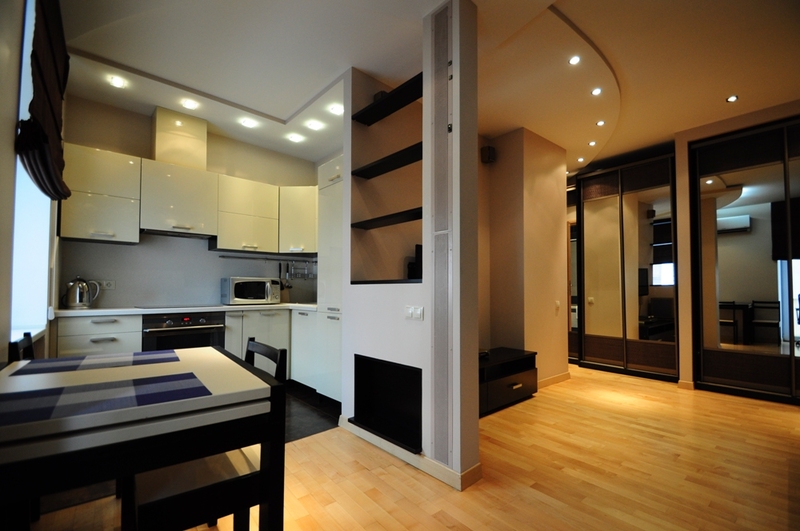 Two room apartment, with a separate bedroom, a total area of 60m2, kitchen-studio combined with the living room. The apartment is located on the 5th floor, with elevator, windows overlook a quiet courtyard. The apartment is newly renovated 2012. The sofa in the living room can be expanded, in the bedroom there is a double bed with orthopedic mattress. The bathroom has a shower stall with a hot plate and floor heating system. 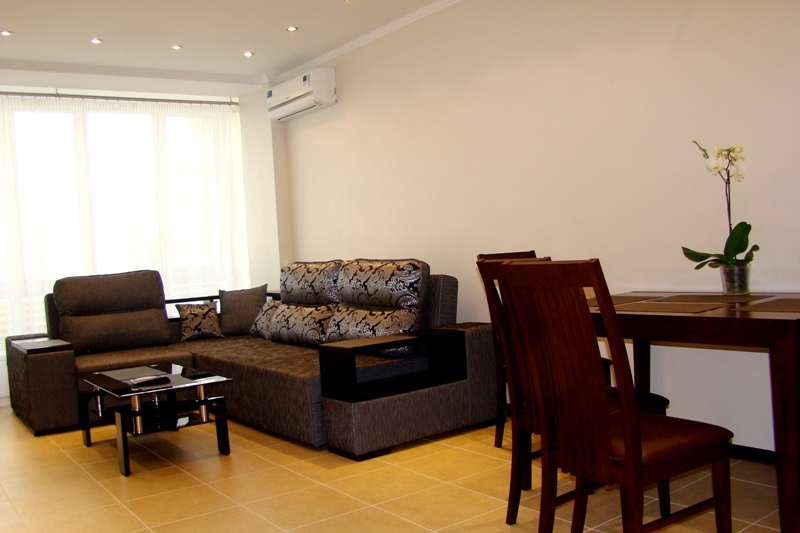 The apartment is fully furnished and equipped with necessary home appliances. 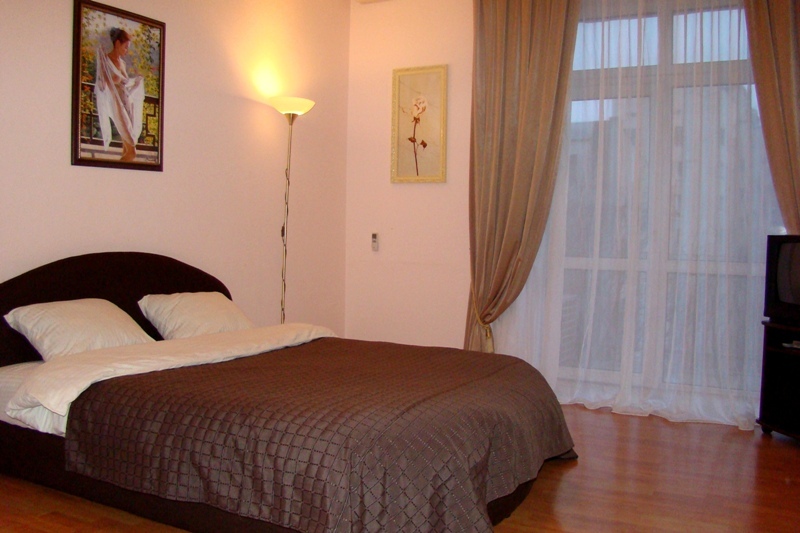 Two room apartment, located 200 meters away from Kreschatik str. 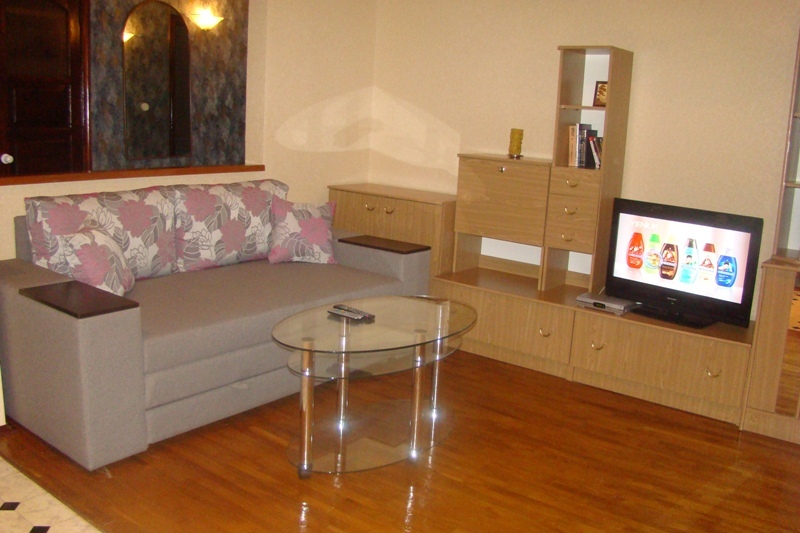 The apartment is fully equipped with all necessary furniture and household appliances. The apartment has a lot of space, a high cealing, a lot of light from the windows and a beautiful view from the window. Apartment has no airconditioning, but the windows are faced to the North. A low price for a central located and two room apartment. The two room apartment is located in the downtown of Kyiv and close to the Square L. Tolstogo and the National Sports Complex “Olimpiyskiy”. It takes 10 minutes to get to the main street of the city – Khreshchatik Street. Close to the building there is a grocery, a small store, banks, ATM, metro stations (“L. Tolstogo” and “Olimpiyskaya”). A bus stop is in 50 meters from the building. On the ground floor there is a restaurant “Vagon-Restaurant” and in three hundred meters there is a fast food restaurant “Puzata Khata”. The Kyiv Operetta is located in 150 meters and the National Sports Complex “Olimpiyskiy” is in 300 meters from the building. Balconies view the Krasnoarmeyskaya Street. This nicely furnished studio apartment has everything one may require during your stay and is located in the prime heart of Kiev’s historic center – directly next to Maydan Nezhalezhnosti (city’s main square) and is less than 100 meters away from the main street of Kreschatik. All the downtown highlights are just minutes away from this location along with dozens of cafes and restaurants. Situated on the 2nd floor of a door coded 9 story building with an elevator the apartment features everything one may require for a comfortable stay. The apartment is spacious, with 40 square meters in total space and a large sunny living room area with two soft chairs. 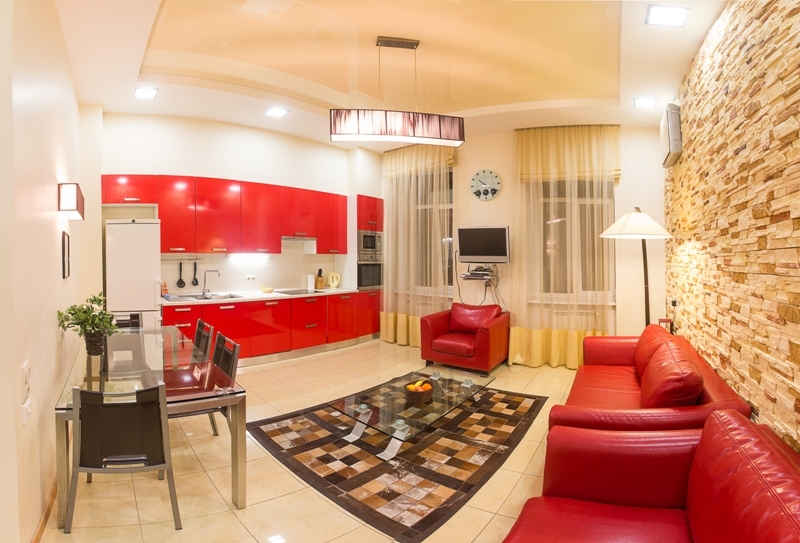 This is a wonderful studio apartment in the very center to consider for your next Kiev stay. One bedroom apartment. After major repair, very cozy, bright and warm. The room is a large double bed with orthopedic mattress, roomy closet where you can mark more than one suitcase of things. The apartment has a balcony which overlooks a quiet courtyard. Not far from the house is a large supermarket (Megamarket) and Cinema (Butterfly). It offers also a clean bed linen, towels (bath, kitchen), paper towels, wipes, liquid soap, slippers, shower gel, shampoo, tea, coffee, sugar. 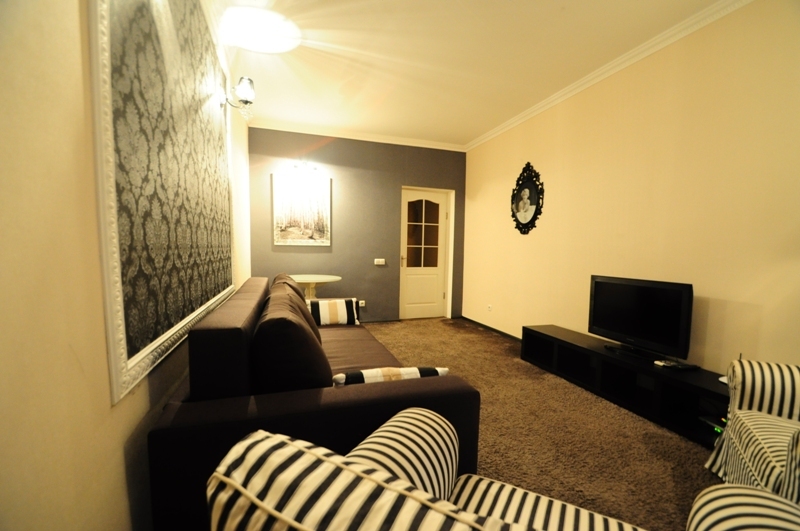 This one room apartment is located in the heart of Kiev, close to the Khreschatyk Metro 150 meters and to the main street Khreschatyk 50 meters. Near the house there is a grocery store, Ukrainian restaurant Puzata Hata, a sushi bar and pubs. 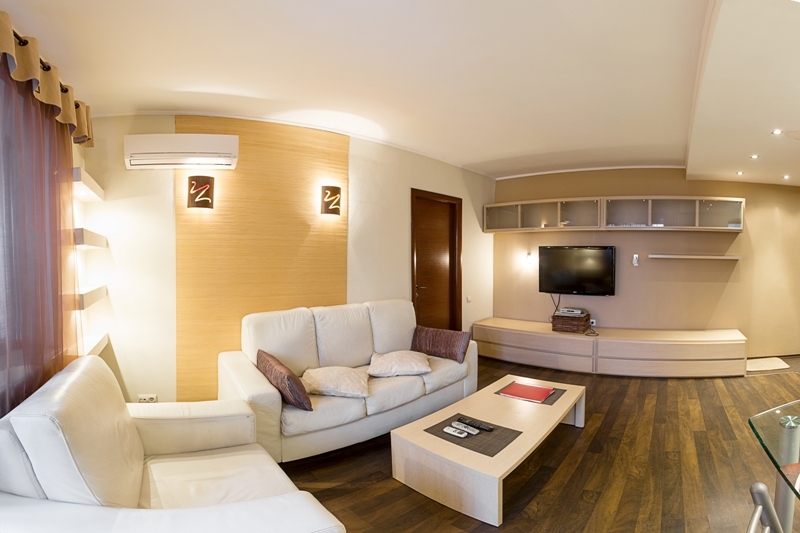 Just a five-minute walking distance of the shopping mall Globus, Metrograd and Arena City. And closeby the theatres Lesya Ukrainka Theater and Ivan Franko, and the National Opera Ukraine Shevchenka. The windows overlook a quiet courtyard. 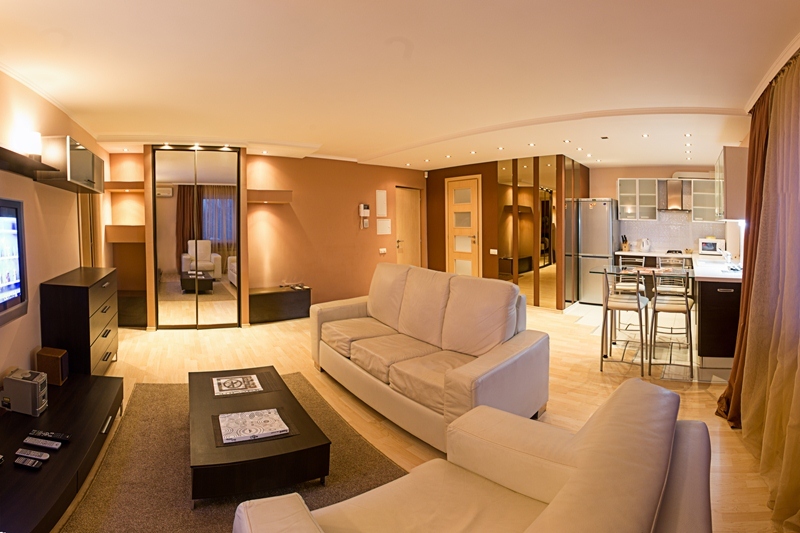 The two room apartment is located close to the downtown of Kyiv and opposite to business centre “Parus”, which is the highest building in Ukraine. It takes 7 minutes to get to the main street of the city – Khreshchatyk Street. While walking down to the street you will pass shopping and leisure center “Mandarin Plaza” and one of the most famous markets of Kyiv – Bessarabka Market. On the ground floor of the building there is a grocery, ATM, and currency exchange office. In three hundred meters there is “Palace of Sports” and a metro station with the same name. Bus stop is right at the building. It takes 5 minutes to get to the famous restaurants “Serebro” (Silver) and “Teatr” (Theatre) and 7 minutes to get to the National Sports Complex “Olimpiyskiy” on foot. Windows view a quiet green yard.